First off and most importantly, a HUGE congratulations to our great friends John and Suzanne Bosch on the birth of their amazing daughter, Victoria "Tori" Bosch!!!! We are soooo happy for them and cannot wait to meet her soon! As far as my day was concerned, it was a bit less exciting. In fact, I have a lot of time on my hands since Jim is studying for the bar exam next month. While skimming through Pinterest, I came across this scrumptious macaroni salad and knew I needed to make it immediately (I mean, doesn't that just look amazing?). I ventured to the grocery store to pick up a few things. The large avocados were on sale for $1...so I bought five. 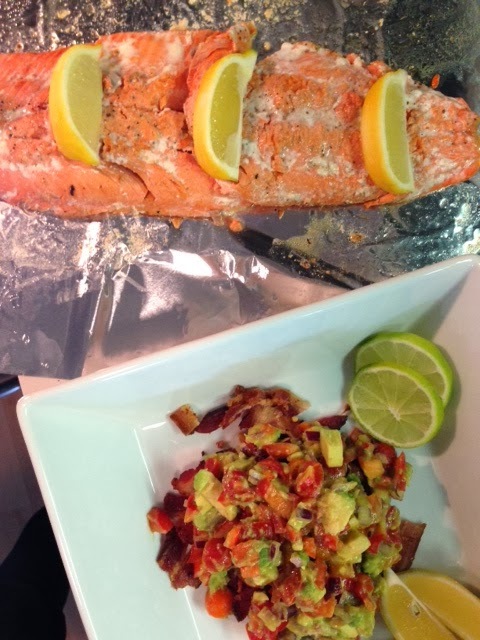 I picked up five avocados, fresh thyme and the applewood bacon. I grabbed a few other items to make a delicious avocado dip (since they were on sale). 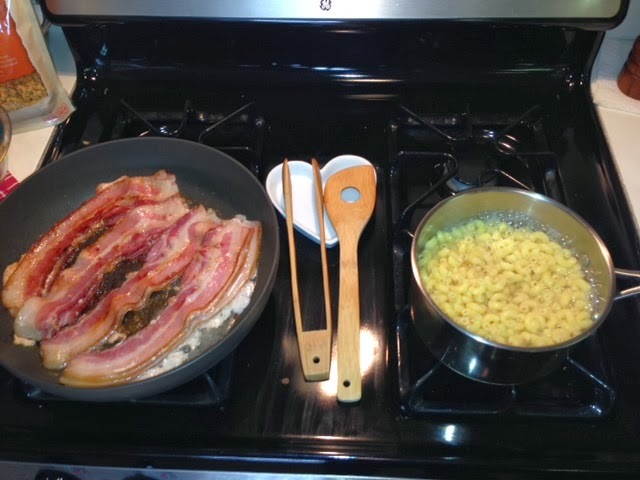 When I got home, I gathered my ingredients, started boiling the elbow macaroni and tossed the bacon in the saute pan on the stove. The cooking didn't take more than 10-15 minutes and I made the dressing in the meantime. It was real simple. 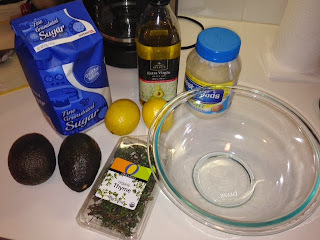 I combined 1/3 cup light mayonnaise, lemon juice, lemon zest (of 2 lemons), a teaspoon of sugar and a teaspoon of fresh thyme in a bowl, with a little sea salt and fresh ground pepper. I mixed it all up and poured it into the "magic bullet" mixer. I mixed it vigorously and added some extra virgin olive oil until it emulsified. I let that sit until the macaroni was done and drained. 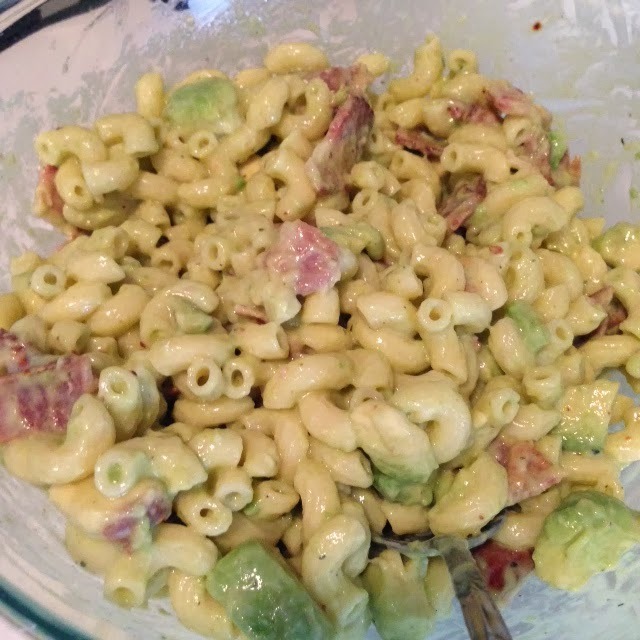 I poured the macaroni into the bowl, drizzled the dressing on top, chopped up my bacon (cooled, on a paper towel) and avocado. I gave it all a big stir and DONE! It was fantastic. What a yummy and different lunch. 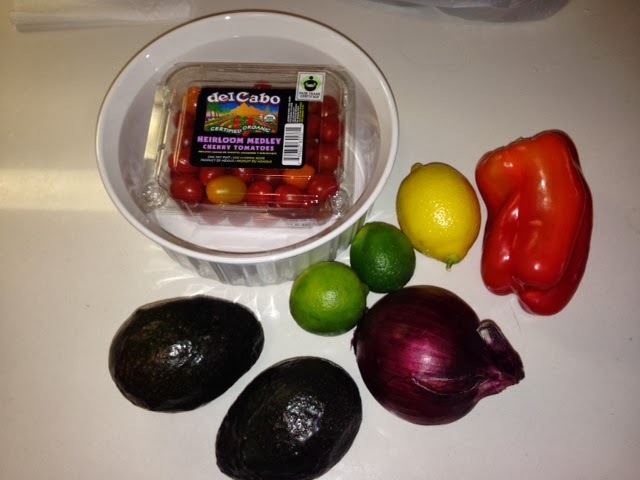 So anyway, this "dip" or "salsa" is real easy...it just takes a few minutes to cut up all the veggies. The secret is making sure everything is really fresh. 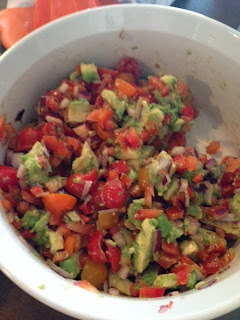 You basically take however much you want of each of the following vegetables - avocado, cherry tomatoes, red pepper, cucumber, red onion, parsley and chop it up real small. You then squeeze a ton of fresh lemon and lime juice over it...and a little EVOO, salt and pepper to taste. 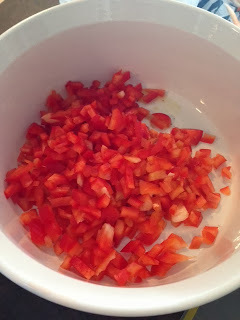 It is amazing with tortilla chips, or even as a side to your dinner. 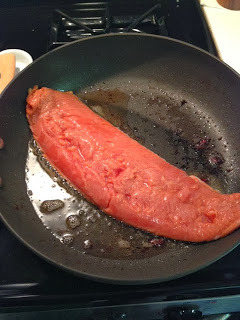 Tonight, for example, I cooked some sockeye salmon and had this "dip" as the side. All the flavors, especially the citrus, went together so nicely. Here are all my veggies, ready to go! I diced up my red bell pepper first. I then moved on to the cherry tomatoes. 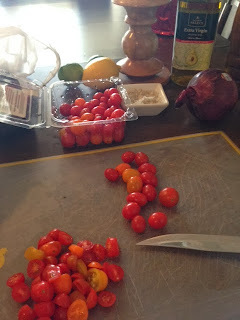 Helpful hint - choose some cherry or grape tomatoes that have different colors. 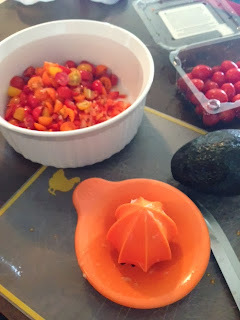 It is a nice way to incorporate color in your dishes, rather than being stuck with just red. This orange juicing contraption is how I get all the juice out of my lemons and limes. I use it way more than one would ever think. It's great! Just make sure not to tilt it to the side because the seeds can fall into your dish, defeating the whole purpose of using it. I suggest using a wooden spoon like I mentioned in one of my first blog posts. When you use the metal spoons, you risk ruining your dishes and tearing up all your veggies. 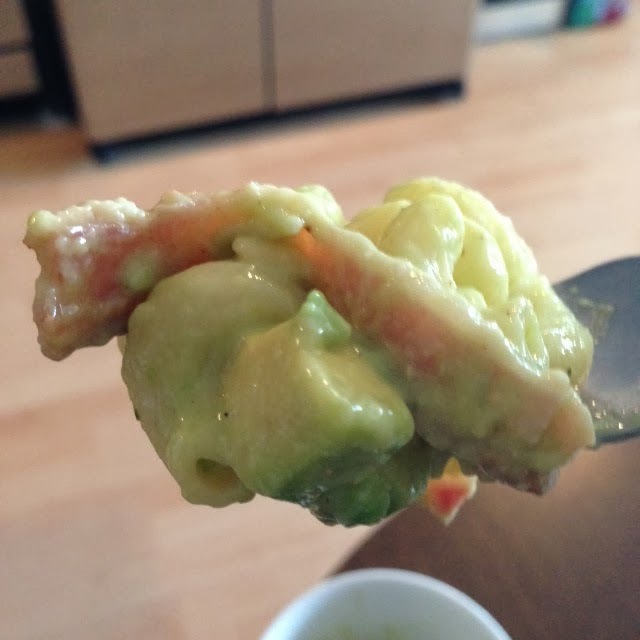 The avocado is real delicate so a wooden spoon is the best choice. I bought about a pound of the salmon. It looks huge, but it was pretty thin. I took out all the annoying pin bones, drizzled it with fresh lemon juice and tossed it in with a little of the leftover bacon grease for that smokey flavor. I cooked it on a medium heat for about 15 minutes, covered. I added more lemon juice before slicing and serving. Enjoy this super healthy and fresh meal!